Caleb Crye and Gregg Thompson, a School of Art graduate ('97) and an Albert Nerken School of Engineering graduate ('00) respectively, formed a business fourteen years ago that perfectly wedded the art and science of their alma mater. 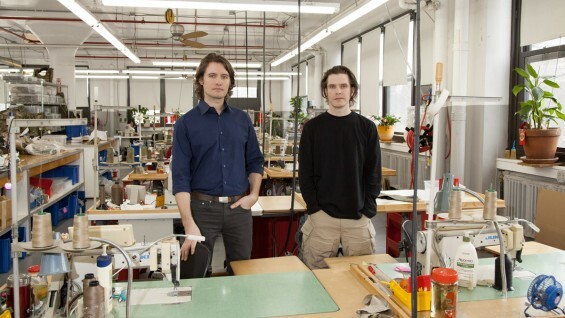 Crye Precision started as a "nothing to lose" spare-time venture in a studio above Chelsea Market that has grown to occupy 56,000 square feet of space employing 150 people in New York and New Jersey. 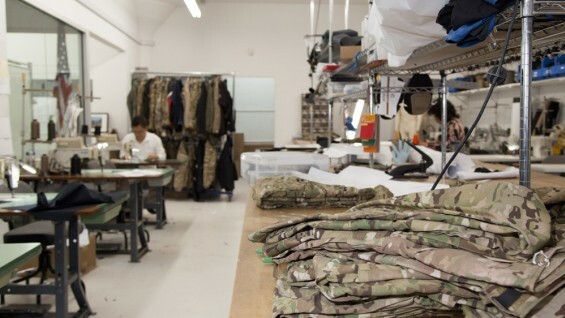 There they design, prototype and manufacture protective clothing for the U.S. military in a business that not only keeps U.S troops alive but also arguably helps keep a shrinking U.S. garment industry alive. Crye, 37, a Tennessee native who keeps his dark hair slicked back and has an ironic sense of humor, still seems much the artist type even if his career path runs counter to any you might expect from a graduate of the School of Art. But a look back at his student work of "conceptual products" -- like the bottle of lotion that fed back on itself called "The Perpetual Lotion Machine" -- hinted at his future in industrial design. "I just took every opportunity to build something," Crye says. Thompson, 36, who could pass as a cousin of Bradley Cooper, grew up in New Jersey, studied mechanical engineering and shared a penchant for building things. The two would frequently cross paths in the sculpture shop. "We were both interested in creating physical items and the process of making something become real," Thompson says. That attitude continues to be born out in the successful business they find themselves running. Post-graduation, after two years of commercial design work, Crye decided to try developing products for the military, "because it would be rewarding and I actually like the military," he says. In pre-9/11 New York, Crye says, "it felt like the military was not viewed positively and growing up I never really had that feeling. I’m a huge fan of freedom and see our military as big part of what safeguards that.” Thompson, still completing his Masters at Cooper while working full time in the sculpture shop, came on board too. For their first venture Crye Precision designed, prototyped and pitched a new version of the crude portable computer then used to calculate angle and propulsion for mortar ballistics. They learned their first hard lesson: the commercial model for getting business does not apply to the military. "We didn't know that's not the way the military works. That's not the way you are going to get a contract," Thompson says. Instead you must develop products that meet a publicly stated need. So they proposed to work on an initiative to "revolutionize the soldier" by focusing on body armor and garments. Their first assignment was to design a new helmet for the Army. They had only eight weeks to do it but crunch-time skills honed at Cooper came in handy. "So we made two, fully-functioning carbon-fiber prototypes that included integrated communications, removable chem/bio protection, flip-down goggles and integrated cameras," Crye says, "It was our first job for the Army and we wanted to hit it out of the park." As it happened, September 11, 2001 occurred at the midpoint of their development work. The resulting escalation in Afghanistan, followed by the invasion of Iraq, put Crye Precision in greater demand. Over time the company found itself focusing more on the needs of Special Forces troops because, Thompson says, "their needs are very tangible and they give direct feedback." However Crye and Thompson began to feel frustrated in their inability to mass-produce the products they designed. "Guys are telling us they want our stuff but we were not a manufacturer at the time and could not say when the gear would be available," Thompson says. So they decided to take a risk and move into the world of production as well as design. This move was not without its challenges, especially since the Berry amendment requires that all textile-based items made for the Department of Defense be domestically sourced. "Every snap and fastener, even the fibers and foam, must be made in the US," Thompson says. In one case an industry-standard fastener was only made in Japan, forcing Crye Precision to design cast and manufacture a new solution. But with that extra effort comes the satisfaction of maintaining a long tradition of garment manufacturing in New York City. "We believe in making things here and building up that knowledge base again," Thompson says. Since its founding Crye Precision has grown considerably. 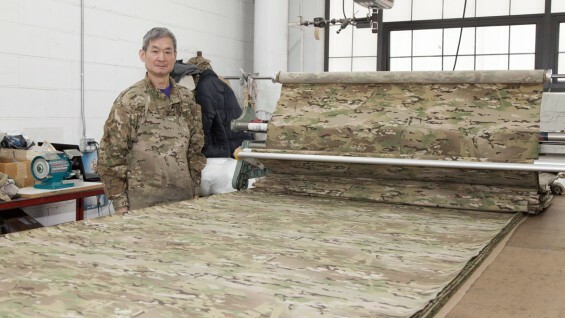 They developed MultiCam, a new camouflage pattern that has become standard-issue. Late last year the U.S. Army awarded them a contract for body armor of up to $50 million. In 2002 the company moved from a studio in Chelsea Market to a space in the historic Brooklyn Navy Yard, a 200-acre former shipbuilding yard that has been converted into commercial real estate. As they have grown Crye Precision has taken space in the Yard as needed, oftentimes across separate buildings and even across the river into New Jersey. In 2014 they will consolidate into a single 85,000 square foot space inside a newly renovated building in the Navy Yard. Last year they were picked by New York Magazine as one of its Reasons to Love New York. "We are unique in that we make a lot of different types of products. We innovate across disciplines. A traditional company may make pants and that's all they do. We compete with them, but we also make helmets, and body armor for example" Thompson says. "We are successful at it, so far, but it is not easy. The military hasn't been used to people innovating. It makes us have to be twice as fast and twice as good to maintain ownership of our designs," Crye says. Their experience at Cooper informs their innovative spirit. At Cooper, Thompson says, "If you want to do something a different way no one is going to get in your way of doing that. That was the whole thing: defend your work. Make what you want to make and be able to defend it." Cooper makes you resourceful, Crye says, "It forces you to learn on your own and that's a quality we focus on with people we are hiring. Give them two or three pieces of the puzzle and they need to be able to fill in all the rest." In spite of the military's fitful relationship with innovation Crye and Thompson almost can't help but work on new things. During a recent visit they showed off a work in progress: a diving suit that completely protects the diver from chemically or biologically contaminated water. "It's always surprising that something like this doesn't already exist," Thompson says. In their front entrance hangs an armor-protective vest that got tested in real combat, with the bloodstains to prove it. It is a reminder that, "there is always work to be done," Thompson says.